Tatiana in front of our car. Some of the rural scenery. I am now on the first leg of the train trip! were getting the scoop on each other. Oh, is there going to be lots of time to know about each other. from Russian characters to English using my limited Russian skills) and it was quite a kick. I was expecting lots of food vendors. others that I would get her to smile before I got off this train. sudden going to comprehend what they are saying. Meanwhile, there is just a clueless look that is plastered across all of our faces. things. Except once. This would be when somebody gassed the entire train in the middle of the night and stole everything onboard. head was feeling funny to go run out into the hallway. Luckily I am still here to write about it so all is good. We did not get gassed. to a small communication barrier. What the heck am I going to do with three kilos of apples??? My apples are now sitting in the corner of the room. The offer has been put out there for anyone to feel free to take an apple. Nobody has done so yet. In the meantime, I am looking at landscape that seems very typical of Russia. 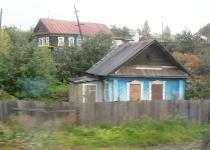 Oh, to be on the Trans-Siberian railroad! over to Cabin #2 and shared my victory story with them. They were beyond impressed. I took a nap. Sadly, during this time, I missed a few minutes of snow on the landscape. A stop where they actually had food options to choose from for lunch! I opted for a savory pastry filled with potatoes. Quite tasty. believe this. Talk about the progress that has been made. I am going to be offering apples to everybody on future train rides. I decided to brush up on my Russian language skills and I asked our provodnista what her name was. She told me it was ‘Tatiana’.